ReadyBath from Medline is a convenient and cost-effective pouch system that can be used at room temperature or warmed for patient comfort. Soft, disposable washcloths are premoistened with a gentle, no-rinse, pH balanced hydrating cleanser that eliminates the need for basins, soaps, linens and lotions. With ReadyBath wipes bathing time is cut in half so nursing staff is free to provide other patient care. Patients' skin is soothed, moisturized and conditioned by Allantoin. 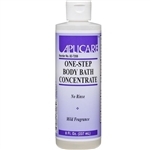 ReadyBath antibacterial formula helps kill germs and eliminate odors. Readybath bathing wipes feature tamper-evident, resealable pouch which contains eight pre-moistened single-use wipes so that each body zone can be cleaned with a separate cloth. ReadyBath single use pouch reduces chance of cross contamination. Z-folded cloths are easy to pull from the pouch. Both product and packaging are latex-free.